We actually haven’t seen too many pumpkin pies yet. From the box of L.S. from Joplin, Missouri. Blind-baking the crust will make it hold up better to the liquid filling. Mix baking powder, flour, and salt. Chill a mixing bowl in the freezer; chill water with ice. Cut lard into flour, then add ice water, a tablespoon at a time, stirring till dough comes together. Form a disc, wrap with plastic wrap, and chill for at least 45 minutes. Preheat the oven to 325 degrees. Roll out until slightly larger than the edge of the pan; press crust into pan. Line crust with parchment, then add pie weights or dry beans. Bake for 20 minutes, then remove the weights and bake till very light golden, about 15 more minutes. Mix together all dry ingredients. Mix pumpkin, eggs, and milk; then stir dry ingredients into wet ingredients. Bake until knife comes out clean. I’d also suggest lowering the temperature to 375 as soon as you put the pie in. Having the temperature higher when you put the pie in avoids having the oven suddenly cool off when you open it to slip the pie in, but 425 is awfully high for a pumpkin pie. A frozen pineapple slush. With Jell-o. Naturally. 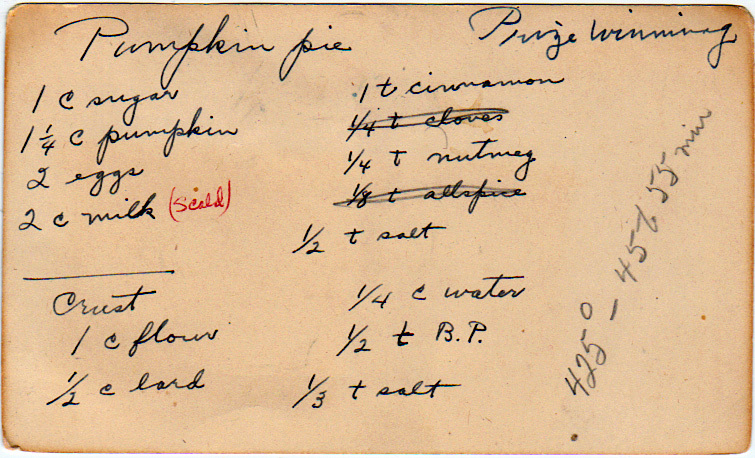 Different proportions than the other pumpkin pie recipe in this box.